I told you I’d share some of the little projects we’ve done the last few months. We’ve been busy, trying to knock out some of our to-do list! Our old, plastic clock stopped keeping time so it was time for something new. 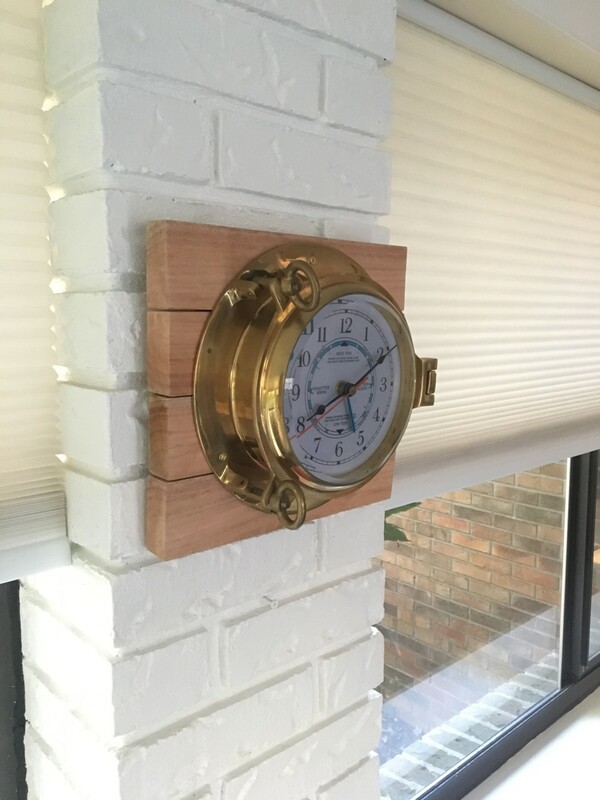 My hubby made a wooden backing from scrap Brazilian hardwood then mounted this brass clock that came off our old sailboat. It matches our coastal home decor! 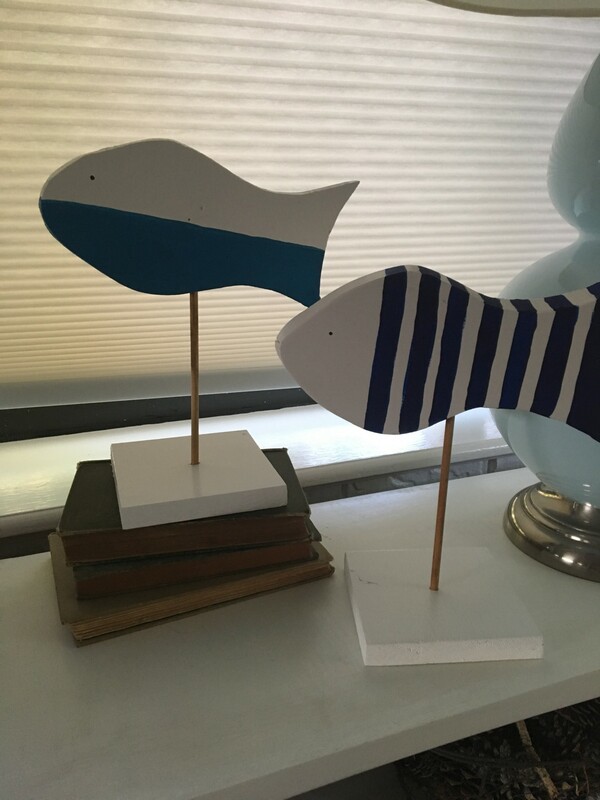 I painted these wooden fish which my dad cut out for me also from scrap wood. I first saw them on this blog I love and copied it! We moved the whole living room around. It took a whole Saturday and lots of pictures texted to my friend for consultation (she works at Ballard Designs and has a real gift!) I really like this configuration we ended up with. 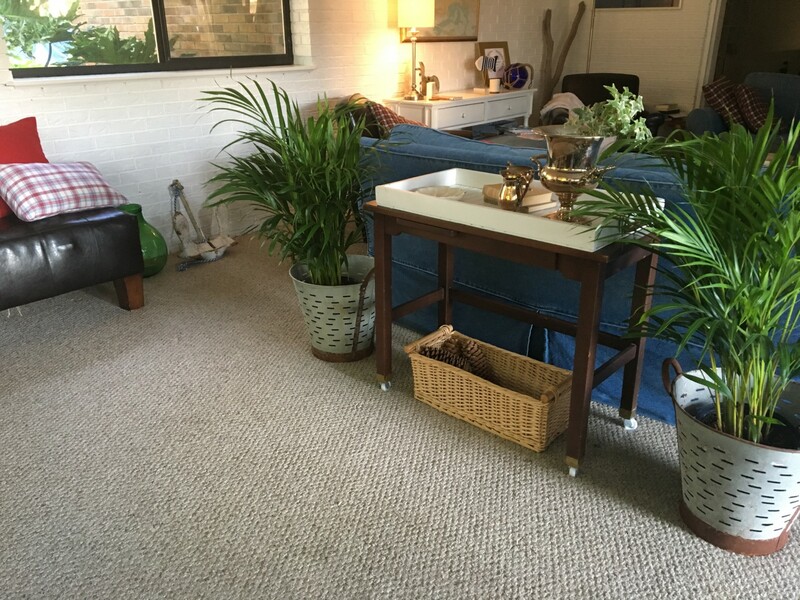 I bought these olive buckets at Christmas from Decor Steals and bought the palms to fill them. I’ve been incorporating more plants into my home now that I don’t have little kids and have time to care for them. My dad also made me the wooden tray out of a leftover piece of bead board and scrap wood. 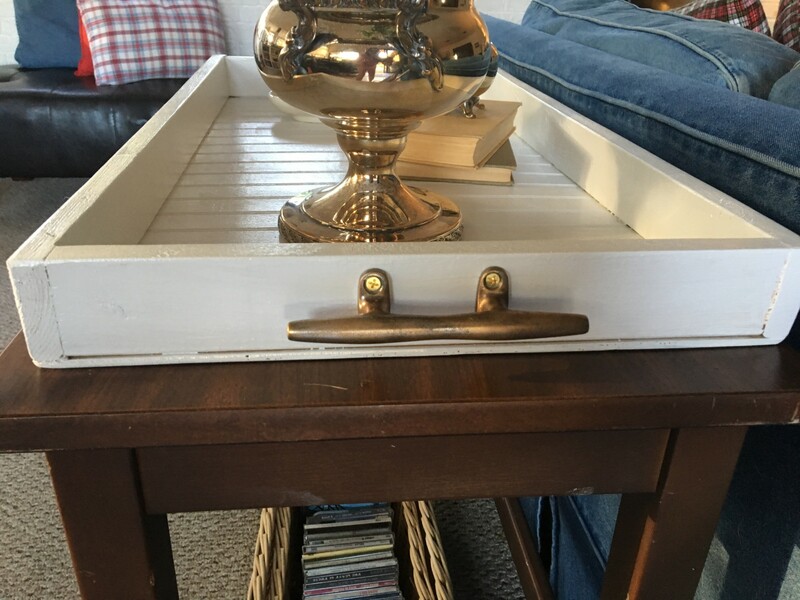 I painted it and hubby added the cleats to serve as handles. More nautical touches! 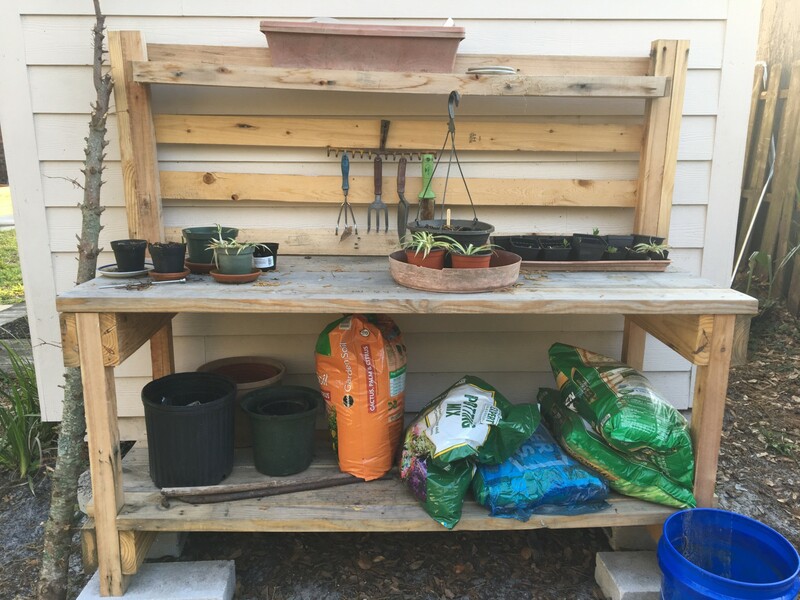 My potting bench had rotted so dad built me another one out of scrap wood. Are you noticing a theme here? He found a glass company that gives away their crates they use to transport their glass in. He patiently took apart these huge crates (think pallets for glass.) So all these wood projects have been practically free! He did have to buy nails/screws for this bench. The paint I used was all leftover paint I already had. I love using things up! I’ve been really enjoying it in the perfect weather we’ve been having! He added the old rake head to serve as a hanging rack for my hand tools. That’s a sneak peek into what we’ve been up to the last few months. These little projects make me so happy! The house is really coming along! Have you worked on any new projects around your house? It all looks great, but I especially like your use of the rake head!!! So creative. Thanks Shirley! I saw that somewhere long time ago so I held on to two old rake heads for this purpose. Let me know if you need one! I have one to share! I love moving living rooms around! Also love the nautical vibe from your place. 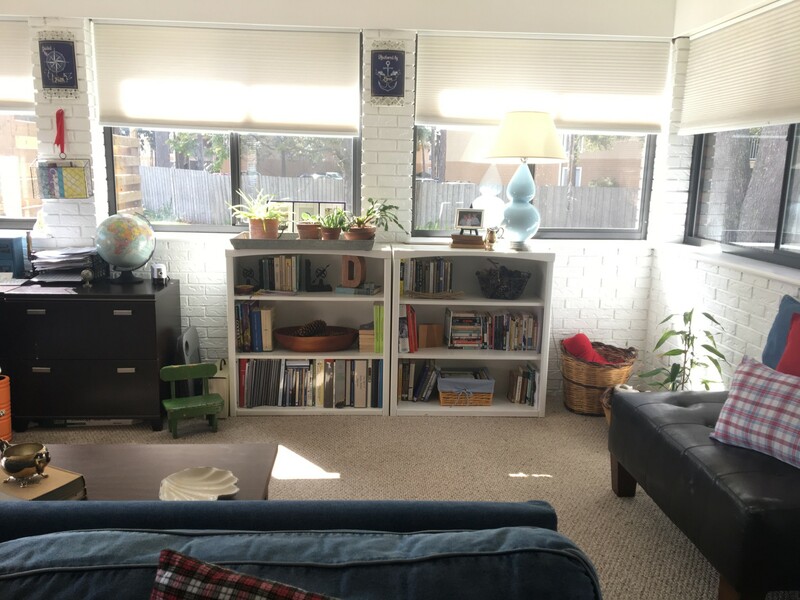 For years we had the living room in one way. Then a friend came over and gave me some ideas. This is the third way it’s been configured in 17 years! I usually stick with something if it works! 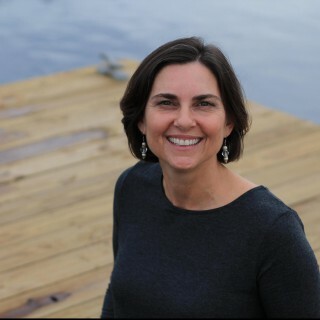 Dabbling in fashion has helped me venture into experimenting in my home. Funny how one thing leads to the other, non?